STALINISM’S IMPACT IS DIFFICULT TO SEE in the world today. North Korea and Cuba limp along, sponsored by a capitalist China and caudillo-ist Venezuela, respectively. The official Stalinist parties in the Western world remain, at least on paper, but tend to throw support behind Hillary Clinton or the local equivalent. In one way or another, any examination of Stalin is thus historical—not a critique of a living political movement, but of a movement situated in a time remote from our own. The object of investigation is a legacy whose practical effect in the present is deeply obscure. The journal Crisis and Critique has recently published a compilation of such examinations. In the introduction, editors Frank Ruda and Agon Hamza emphasize their desire to examine the politics that led to Stalin and shaped the period during which he lived, neither damning nor defending, and hoping to avoid the reduction of complex questions to the status of a single individual. As Lars Lih points out in the first contribution, Soviet artists celebrated Stalin as a mythical figure, an ersatz czar who defended the Russian people. Indeed, Stalin invites a series of historical comparisons. By turns he is Robespierre, by turns a brute responsible for the failure of a revolution. For Domenico Losurdo, he is the Soviet Gandhi, fighting against colonialism with methods no more dictatorial than the global crisis of the 1930s demanded. Enver Hoxha’s essay, which closes out the volume, does not need to mention Stalin by name to argue that he enabled the people to “write their own history,” and that we must stay to the course he laid out, if we wish to defend the revolution and achieve the political empowerment of the masses. Elsewhere Stalin curiously recedes into the background. He becomes the pretext for a discussion about the metaphysics of language, or for an analysis of how his early seminarian experiences influenced the creation of the new communist man. Or the topic shifts to the philosophical school of dialectical materialism, analyzed without really taking stock of Stalin, who hovers quietly in the background. And there is the experience of those who lived under Stalinism, and the memory of the political struggles over revisionism and orthodoxy. 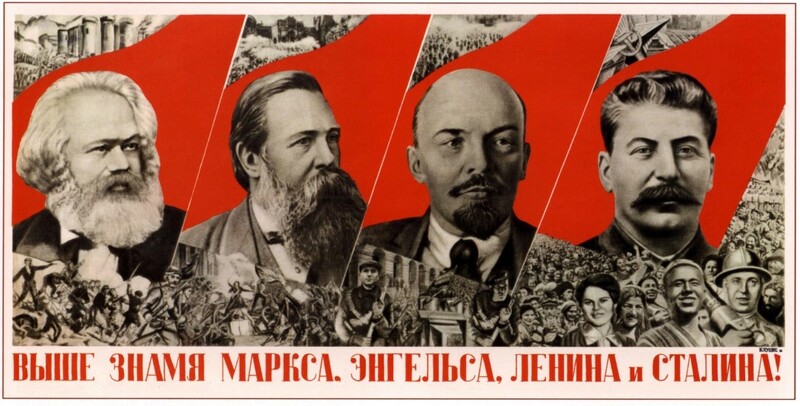 Soviet propaganda portrayed Stalin as the natural successor to the great Communist figures of Marx, Engels, and Lenin, as in this poster from 1936. With all these views (and more) of Stalin represented in this volume, one might think that the subject, if not exhausted, had at least been opened up for inquiry. Unfortunately this is not the case, unless we want to understand the long shadow of Stalinism as only the latest in a line of tragedies. However, whatever else we may think of him, Stalin is far more than merely a Tamerlane or an Alexander Nevsky. The Russian Revolution of 1917 represented the most profound change in the history of the world since the advent of modern capitalism. Nothing short of worldwide socialist revolution, which is what the Bolsheviks hoped to ignite, could have lived up to its promise. So long as that revolution has not taken place, Stalinism’s legacy remains indeterminate. While striving to offer a left-wing alternative, the Trotskyist movement failed to accomplish its goal of re-creating the revolutionary moment of 1917. Each crisis of capitalism became more obscure as revolutionary potential grew more distant. The Soviet workers who believed themselves to be building a new and just future became the cynical loafers of a system older than its increasingly forgettable and geriatric leaders. The revolutionary who in the 1930s helped to organize major strikes became the greying seller of a street newspaper. Was Stalin the great organizer of defeats or the necessary preserver of the power of the working class in a time of reaction? As recently as the 1970s the question would have had a different and more pressing relevance. One’s position as a leftist is in many ways determined via a referendum on history. Break with Marxist tradition on the War Credits vote, and you become a social democrat. Stay, and break over Kronstadt, and one might be a democratic socialist. Further divisions emerge based on one’s stance regarding the Trotsky–Stalin opposition and the various breakups of the Eastern Bloc. If these dividing lines no longer seem to matter, it is because nearly all roads in the present have ended up in similar places, politically: either rapprochement with the Democratic Party and its homologues, or enthusiasm for the triumphs of military strongmen. But to those involved in such debates in the past, these positions held the deepest significance: The correct path meant retaining in their politics the goal of world revolution. Today, that relevance is gone. Without it, Stalin and Stalinism cannot be assessed in terms of revolutionary theory, but only through the lens of the academic historian. The promise set forth in the introduction of “Stalin: What Does the Name Stand for?” cannot be met by the essays contained in it. To discuss Stalin’s theory of the New Soviet Man as an anthropological one, as Roland Boer does, and to place it alongside the theories of Pelagius and Augustine, is an illuminating piece of scholarship, but it does not orient one to today’s political possibilities. The role Stalinism played in foreclosing those possibilities is only hinted at in the introduction and addressed head-on in a few of the essays. However insightful, most of the contributions in “Stalin: What Does the Name Stand for?” do not grapple with the historical and political dimensions of this problem, today, in light of the history of the Left. They thus fall outside the scope of this review. What remains are the writings of Stefano G. Azzarà, Bill Bowring, Paul LeBlanc, Judith Balso, and Domenico Losurdo. Azzarà considers how we remember Stalin in the limited context of Italian historiography. The concept of “totalitarianism,” that is, the equation of Stalin with Hitler, has been deployed to rehabilitate the Italian state and current social order, thereby undermining the Left. The political ascent of neoliberalism and the decline of the Left are bound up with this historical amnesia, which erases the distinction between communism and fascism. The emergence of historical revisionism takes place alongside the defeat of socialism. The new right-wing parties, untainted by association with the fascism of their ideological parents, throw the charge of dictatorship against their opponents. For Azzarà, the young historian Ernst Nolte provides the way forward: The totalitarian thesis proves too much. Central to every state is the sort of force and public propagandizing that, according to the liberal critique of totalitarianism, have corrupted politics in mass society. Thus nothing can be said of progress in history. As Azzarà states, “any direct or indirect reference to Communism has failed while the anti-fascist identity remained intact.” Yet, ultimately, a reenactment of anti-fascism is not enough; one must affirm the necessity of socialism. The political task today is a new reconstitution of what it would mean to be a communist. For Losurdo, Stalin is first and foremost an anti-imperialist. One is tempted nowadays to point to the Baltics and mass resettlements of ethnic groups as a counterpoint, but there is a logic to Losurdo’s view. Losurdo argues that the Soviet Union was a land of 160 races devoted to preserving the national culture. Nazi Germany’s eliminationist plans for the East were only a more virulent form of the designs that the democratic states of France and the United Kingdom had carried out in Africa and the Americas. Stalin did abandon the struggle for socialism against capitalism, Losurdo admits, but was nonetheless an anticolonialist in a world governed everywhere by racism and genocide. On this view, Molotov–Ribbentrop was no more than a tactical alliance, and Stalin was a dictator amid a global crisis that demanded a strong hand. The end of colonialism begins at Stalingrad; against the liberal critique of totalitarianism, which tends to equate Hitler with Stalin, Losurdo argues for an anticolonial viewpoint that equates Hitler with Churchill. I would argue differently. 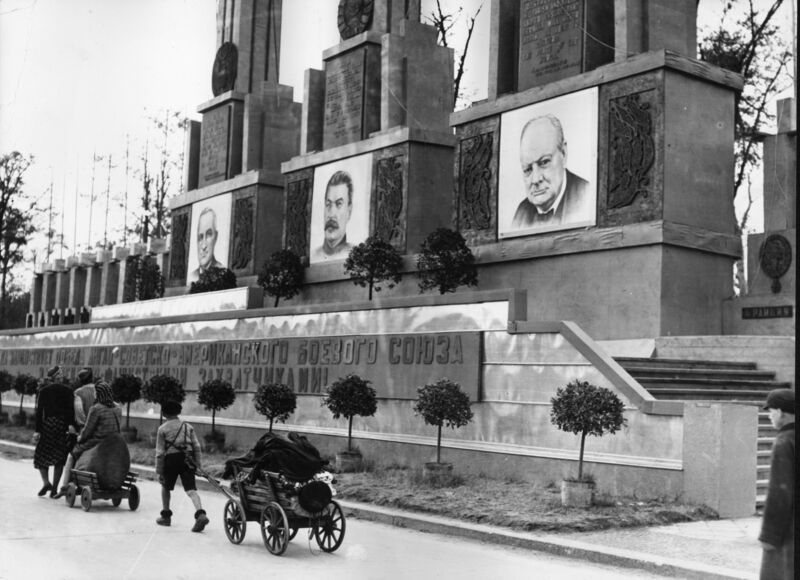 The crowning glory of Stalin’s reign was Stalingrad, Leningrad, Moscow, and then the road to Berlin. These were not triumphs of the workers of the world, however, but nationalist victories, stained by accusations of cooperation with the fascists and tyranny. Preferring Soviet Russia to Hitler’s Germany is senseless—it becomes a matter of picking one’s poison—unless the preference is rooted in the history of 1917 and the revolutionary potential that the Soviet state might have retained, even at so late a time as the 1930s and ’40s. Otherwise, it becomes a choice between competing, reactionary nationalisms. Bowring asks if Stalin should be rehabilitated, as Cromwell and Robespierre have been. In contemporary Russia, Stalin is seen as a great national hero, with Putin restoring the statues of Stalin and Dzerzhinsky in front of the Lubyanka. Cromwell permanently assured Parliamentary supremacy. Robespierre was far less bloody than the legend his enemies made of him, and his partisans can point to his record as a defender of equality for Jews, his abolitionism, and his submission to the judgment of the Committee of Public Safety. Ultimately, what sets the enemies of Cromwell and Robespierre against them is the success they found in leading revolutions. Stalin murdered all the Old Bolsheviks who refused to become his cronies. His cruelty should be contrasted with Lenin’s toleration of political opponents; no major Mensheviks were executed during the Red Terror. The restoration of Stalin today in Russia is the restoration of a modern czar, not a revolutionary. LeBlanc and Balso also engage with the question of Stalin’s legacy as a revolutionary. For LeBlanc, Stalin represents a turn away from global socialist revolution to the demands of industrial modernization. Stalinism is, in short, “authoritarian modernization in the name of socialism,” which came at the price of subordinating communist politics in the rest of the world to the narrow interests of the Soviet Union as a nation. Balso, by contrast, offers apologetics, arguing that Stalinism was nothing more than an expression of the totalitarianism inherent in any revolution. In other words, Balso concedes to the standard, liberal criticism of revolution; she merely praises what such criticism finds abominable. Though differing on the necessity of Stalin, LeBlanc and Balso agree on the broad strokes: Stalinism was revolution from above, with propaganda driving the masses, a large party bureaucracy, and a political disposition animated by one-sided anti-liberalism. With society subordinated to the state, the revolutionary potential of 1917 atrophied. What is missing from all these approaches, then, is a detailed analysis of what Stalinist politics meant on a global scale. What did Stalinist parties believe and how did their positions affect the prospects for world revolution? What did the overall decline of the Left in the course of the 20th century do to them? Jean-Claude Milner, “The Prince and the Revolutionary”: 70–80. Bill Bowring, “Cromwell, Robespierre, Stalin (and Lenin? ): Must Revolution Always Mean Catastrophe?”: 267–387. Domenico Losurdo, “Stalin and Hitler: Twin Brothers or Mortal Enemies?”: 32–48. Samo Tomšič, “‘No, it is not true!’: Stalin and the Question of Materialist Science of Language”: 388–409. Roland Boer, “A Materialist Doctrine of Good and Evil: Stalin’s Revision of Marxist Anthropology”: 108–155. Evgeny V. Pavlov, “Comrade Hegel: Absolute Spirit Goes East”: 156–189. Cécile Winter, “Staline selon Varlam Chalamov”: 190–257. Paul LeBlanc, “Reflections on the Meaning of Stalinism”: 81–107. Stefano G. Azzarà, “A Left-Wing Historical Revisionism: Studying the Conflicts of the Twentieth Century After the Crisis of Anti-Fascist Paradigm”: 421. The Maoist insurgency in India: End of the road for Indian Stalinism?